There are lots of multi-family homes and communities that are NOT set up as condominium associations. Should I consider those options, and avoid the risk and cost of condo fees? We would always advise anyone making any major purchasing decision, to carefully consider, and weigh the pros and cons of all options available to them. Because the exterior of the entire community is automatically maintained, you never have to worry about your neighbors neglecting the exterior of their home, bringing down property values all around them. We have been building communities like this for over 30 years and even the ones we did decades ago, still look great today (better even than when they were new, as all of the foliage has matured). Other communities built at the same time, that were not set up as condos, have not held up nearly as well. One of the issues with duplexes and townhomes that aren’t part of a condo association, is that each home is individually owned, and not everyone will agree on when and what to do with the exteriors, which makes it logistically difficult to coordinate things like roof replacements, siding replacement, fence replacement, etc, not to mention the issue of mismatching products and colour schemes. This is why we say that one of the reasons we insist on condo associations for our townhome communities is protect our reputation. We’re very proud of all the communities that we’ve built, and as you can see by the photos, they still look great after all these years, and would be somewhere anyone should be proud to live. With the condo association being responsible for all of the exterior maintenance, including lawn mowing and snow removal, you can feel free to go on holidays or take long weekends away, without having to inconvenience your friends and family with taking care of your yard and sidewalks. Even if you’re home, who wants to spend evenings and weekends shoveling snow and mowing lawns? (If you are one of those people though, again, this might not be the right fit for you). Also, you don’t have to be responsible to do all this work after you move in, which is often the case with townhomes that are not part of a condo association. Landscaping and fence building is a lot of work! Replacing things like roofing, siding, fencing, and eventually even windows, can be expensive (and time consuming), each costing potentially several thousand dollars at a time. That’s a big financial hit for most people to take at one time, and could cost them a much needed vacation, or new vehicle or take a huge chunk out of their investments. One of the biggest hassles associated with living in a townhome or other multi-family community, can be the fight for parking. Without assigned stalls, in some communities, parking devolves into a free for all, first come, first serve, never ending battle, often generating animosity between neighbors. That’s simply not pleasant, or healthy. In a condo association, each homeowner will have clearly designated stalls, as well as visitor parking will be assigned and visibly labelled. The actual number of stalls will of course vary from community to community and will be based on factors like the size & types of homes there are, access to on street parking, location of the community, etc. When a multi-family building is part of a condo association, there is a requirement for professional engineering designs, plan reviews and inspections on all structural and architectural components. This of course helps protect the condo association which is responsible for the structural integrity of all properties within the community; but more importantly, it protects the homeowner from the nightmare of major structural defects, which are hard enough to deal with on a single family home, let alone on a multi-family building! 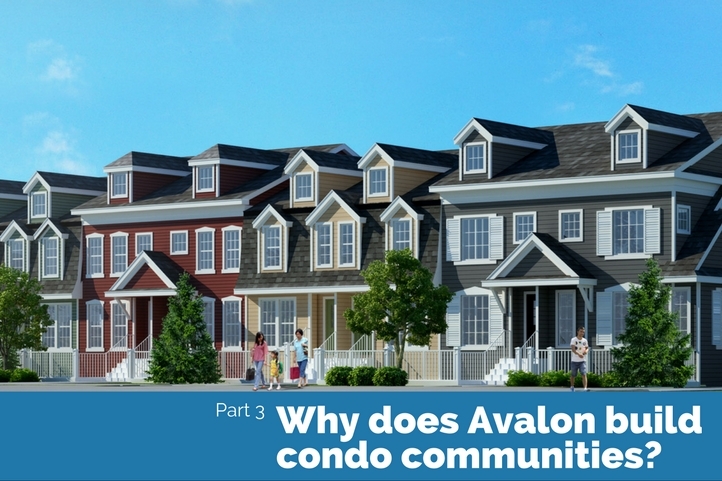 How does an Avalon townhome community differ from other townhome condo communities? We’re the first to admit that there are some other appealing townhome condo options with various styles of homes by other builders & developers, some of them very reputable. In fact, most builder/developers that take the time and effort to set up a condo association for their community (it’s a lot of work! ), are already showing a fair amount of due diligence and confidence in their product and workmanship. So if you’re comparing multiple options, you should be favoring the one that has the building styles and features that best suit your lifestyle and budget, and feel fairly confident that you’ll be choosing between solid options. We mostly cater our home designs for young to middle age singles, couples and small families. Most of our communities feature 2 storey plans with 2-3 bedrooms. There are a few other builders in the central Alberta market who cater to the older crowd with bungalow style designs, and we are happy to point people interested in them towards communities like this in progress. – We specifically utilize higher end, longer lasting building materials on these sites to keep condo fees down. We use products like vinyl fencing, lifetime rated shingles, aluminum railing, triple glazed windows and composite cement siding and panels on our homes to ensure that they won’t have to be replaced for a VERY long time, if ever. Sure, they are more expensive up front, and that makes our homes cost marginally more, but we look at a condo association as a business, and one thing all good businesses do, is ensure to that their infrastructure is built to keep operational costs at a minimum over their entire life cycle, because they know that in the end, this actually saves substantial amounts of money. Posted in Condo Fees, Home Ownership | Tagged in Tags: Condo Fees | No Comment.